Karigan G’ladheon is a Green Rider—a seasoned member of the elite messenger corps of King Zachary of Sacoridia. King Zachary sends Karigan and a contingent of Sacoridians beyond the edges of his nation, into the mysterious Blackveil Forest, which has been tainted with dark magic by a twisted immortal spirit named Mornhavon the Black. At the end of Blackveil, in a magical confrontation against Mornhavon, Karigan is jolted out of Blackveil Forest and wakes in darkness. She’s lying on smooth, cold stone, but as she reaches out, she realizes that the stone is not just beneath her, but above and around her as well. She’s landed in a sealed stone sarcophagus, some unknown tomb, and the air is becoming thin. Is this to be her end? If she escapes, where will she find herself? Is she still in the world she remembers, or has the magical explosion transported her somewhere completely different? To find out, she must first win free of her prison— before it becomes her grave. And should she succeed, will she be walking straight into a trap created by Mornhavon himself? 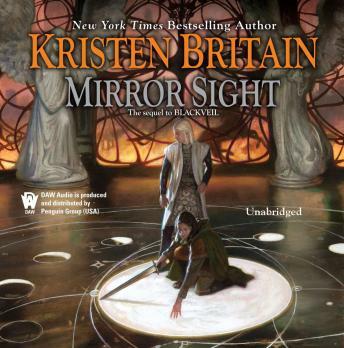 Mirror Sight is the highly-anticipated fifth installment of the Green Rider series. Very immersive, along the lines of the book took in its story took me by surprise one of the best stories I have listed to.